Twenty years after the coveted 1998 win in Nagano, the U.S. Olympic Women's Ice Hockey Team wins GOLD! 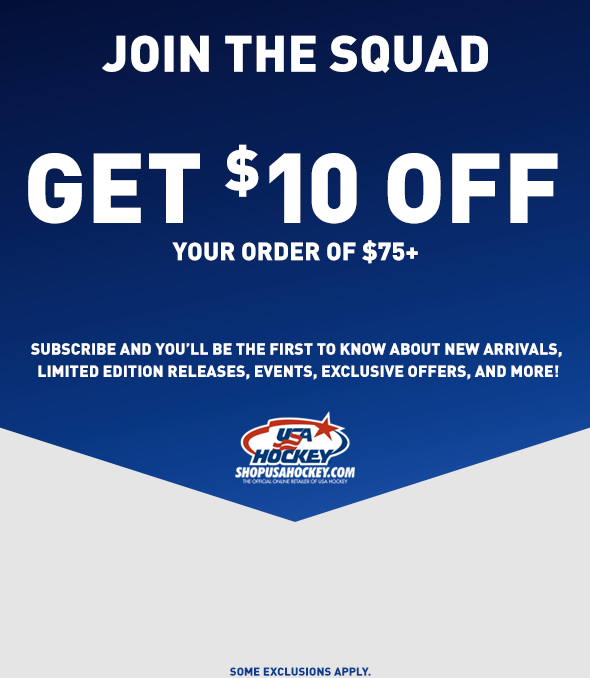 Show your pride by wearing the Nike SHOPUSAHOCKEY.COM EXCLUSIVE T-shirt featuring the Olympic Gold Medal design on the chest and USA Hockey logo on the left sleeve. Comes in sizes S-2XL for Men and XS-XL for Women. Wear the Official Nike IIHF World Junior Championship Dri-FIT Zip-Top. Designed with IIHF WJC Buffalo logo on the center chest and Swoosh on the left. Color: Navy . Available in S-XL. Wear the Official Nike IIHF World Junior Championship Dri-FIT tee. Designed with IIHF WJC Buffalo logo on the center chest and Swoosh on the left. Color: Navy . Available in S-XL. Keep cool with this retro athletic style Nike full-zip made from a lightweight cotton blend French terry fabric for an ultra-soft feel. Decorated with the USA Hockey Wave Logo on the left chest and Swoosh on the right chest. Color: Navy and Royal. Available in S-XL. Celebrate your die-hard USA Hockey fandom by sporting this comfy Nike Tri-Blend Tee, featuring the USA Hockey wave logo on the chest, Swoosh on the left. Color: Navy. Available in S-XL. Celebrate your die-hard USA Hockey fandom by sporting this comfy Nike core cotton tee, featuring the USA Hockey wave logo on the chest, Swoosh on the left. Color: Gray. Available in S-XL. Get in the game with this women's Nike heathered 1/2 Zip Top, featuring the USA Hockey Shield on the left chest and Swoosh on the right. Color: Navy Heathered . Available in S-XL. Wear the Official Nike IIHF World Junior Championship Dri-FIT tee. Designed with IIHF WJC Buffalo logo on the center chest and Swoosh on the left. Color: Navy . Available in S-2XL. Wear the Official Nike IIHF World Junior Championship Dri-FIT quarter-zip top. Designed with IIHF WJC Buffalo logo on the left chest and Swoosh on the right. Color: Black . Available in S-2XL. Hit the rinks with this classic Nike Varsity Polo with Dri-FIT Technology that is jacquard knitted to wick away sweat and help you keep dry and comfortable. The USA Hockey Wave logo is featured on the chest and Swoosh on the left chest. Color: Navy. Available in S-2XL. Get in the game with this Nike Tri-Blend tee, featuring the USA Hockey Shield in the chest, Swoosh on the left. Color: Navy Heather . Available in S-2XL. This Nike Retro Women's Gym Full-Zip features the "Swoosh" and the USA Hockey wave logo on the left leg. A true Nike original exclusively for ShopUSAHockey.com. Available in S-XL. This Nike Retro Women's Gym Full-Zip features the "Swoosh" and the USA Hockey wave logo on the left chest. A true Nike original exclusively for ShopUSAHockey.com. Available in S-XL. This short sleeve Nike Women's tri-blend tee features the "Swoosh" and iconic USA Hockey Block lettering in the front and Arc & Star logo on the sleeve. A true Nike original exclusively for ShopUSAHockey.com. Available in XS-XL. Performance knit shorts are just right for working out in the gym or hanging out at the beach. Athletic shorts are 100% polyester, have a 10" inseam, exposed elastic waistband with draw-cord and the USA Hockey? logo screen-printed on the left leg. Large side pockets. Machine wash and dry. Color Navy and Grey. 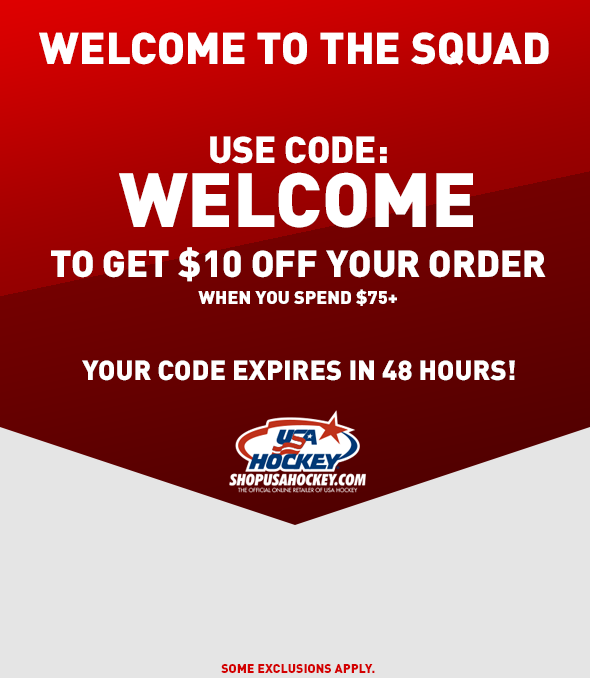 Hockey loving ladies, this one is for you! A cute deep v-neck t-shirt crafted from ultra-soft Tri-Blend material, this tee is decorated with the USA Hockey Wave logo and the words USA Hockey faded design gives the shirt that great vintage look and the swoosh appears on upper left chest. DISCONTINUED ITEM AND AVAILABLE ONLY WHILE SUPPLIES LAST! This Nike polo with Dri-FIT features a sweat-wicking, ventilated design and a comfortable fit for any coach. The USA Hockey? wave logo is displayed proudly on the chest, as well as the classic ?swoosh? on the sleeve, and Arc & Star logo on the back. Polo shirt is available in sizes S & M.
This short sleeve Nike t-shirt features the "Swoosh" and USA Hockey on the full front with the classic USA wave logo on the bottom back. A true Nike original exclusively for shopusahockey.com. Available in colors Navy and Grey. Sizes S-2XLarge.